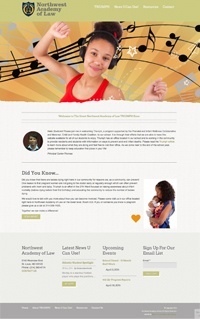 Blue’s ArtHouse proudly presents our newest website creation for the Northwest Academy of Law. This website, funded and maintained by TRIUMPH, provides resources and information to students of the Northwest Academy of Law on ways to prevent and end infant deaths. The site targets students with a fun design and interesting articles with information about relevant topics. We had a lot of fun creating the lively, upbeat slider on the front page. Be sure to move your cursor over the slider to see the 3D parallax effect.